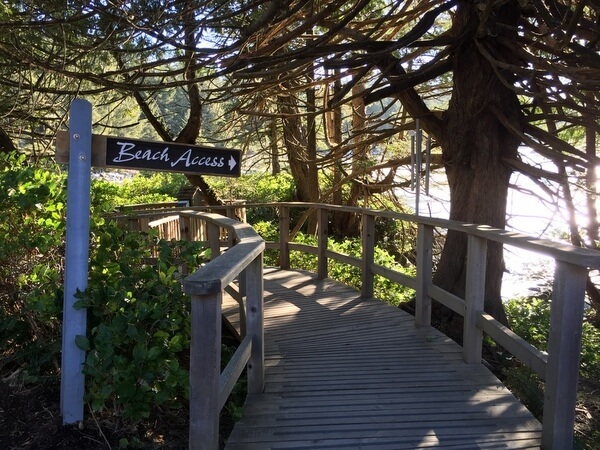 The Wickaninnish Inn overlooks the sea above Tofino’s Chesterman Beach. 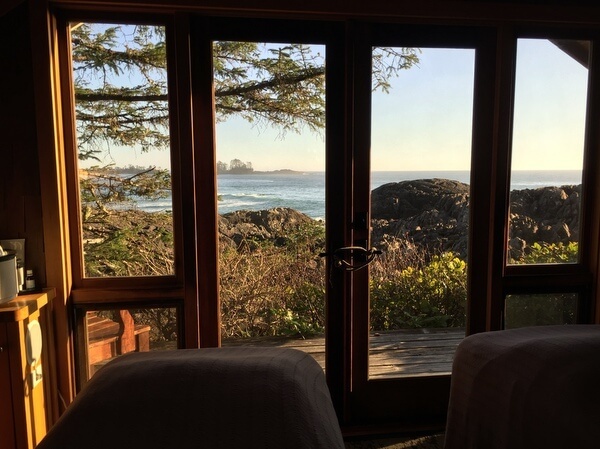 If you have the chance to walk through the Wickaninnish Inn with Charles McDiarmid, you’ll see right away that the owner of this deluxe oceanfront lodge on Canada’s Pacific Coast cares about details. McDiarmid points out the hand-cut wooden puzzles in the library. The binoculars set on the Douglas fir mantles above the guest room fireplaces. The boot dryer tucked into a hallway closet. There are locally made soaps, hand-forged lamps, and cabinets crafted from reclaimed boards. The windows — even in the guest room baths — are positioned to capture the views of the Pacific Ocean just outside. Windows from the bathrooms capture the views. 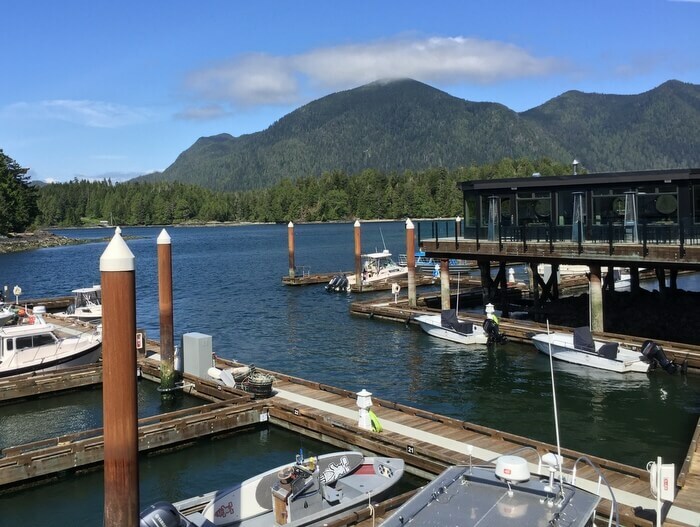 McDiarmid’s family helped launch the Wickaninnish Inn, which opened in 1996 in the surfer-friendly town of Tofino, British Columbia, on the far west side of Vancouver Island. 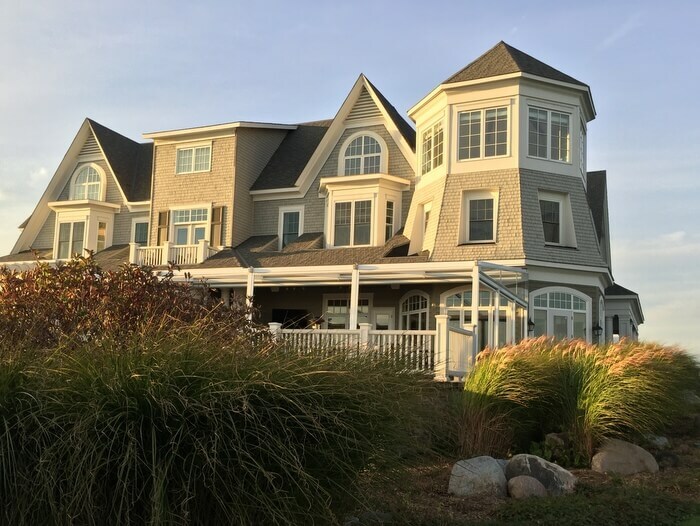 Sitting on a point that juts out above the sea, the original wood-and-stone Pointe Building has 45 guest rooms, as well as the restaurant, bar, and spa. The inn’s second structure, completed in 2003, is the 30-room Beach Building. 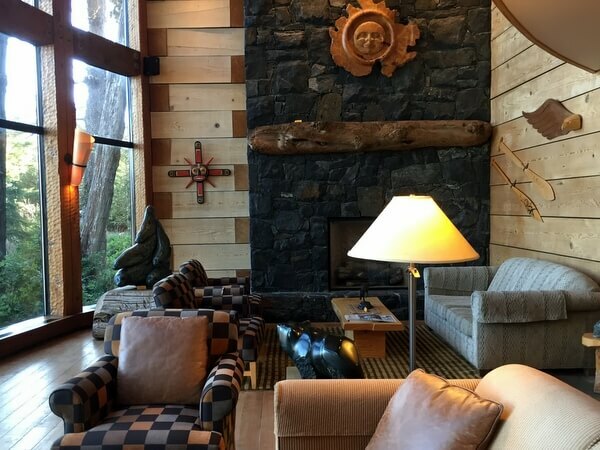 In its lobby lounge, decorated with First Nations carvings, two-story windows look out through the evergreens directly onto Chesterman Beach. Above the lobby, a second-floor library, stocked with books, magazines, and DVDs, overlooks the beach as well. The fitness center and a casual cafe are located on the lower level. Both buildings have a reception desk that’s staffed 24-7, and staff who are quick to tend to whatever guests need, from parking your car to making suggestions about things to do in the area. The room decor is similar in both the Pointe and Beach Buildings. 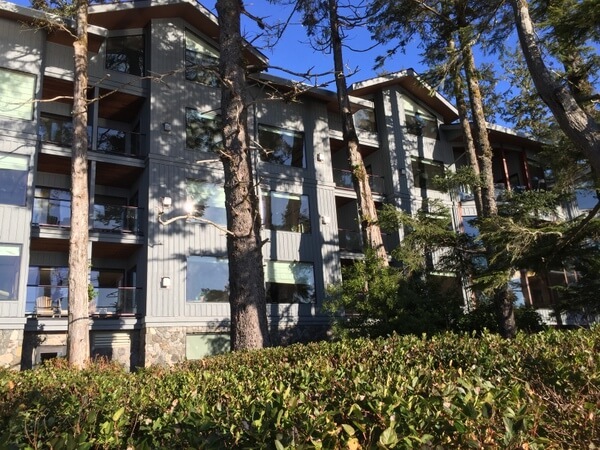 Decorated with warm cherry-toned wood furnishings and sea-green upholstery, all units have gas fireplaces, balconies, and views of the beach or across the rocks to the ocean. TVs are hidden inside desks or cabinets, so as not to disturb the views. Room amenities include coffeemakers, tea kettles, Wi-Fi, and CD players with a selection of peaceful jazz, pop, and other music. In the closet, there are towels and blankets for the beach, refillable metal water bottles, and a backpack to carry your beach gear. If you visit during the winter “storm season,” when the waves can come crashing onto the beach, you’ll be glad that the closets also contain bright orange rain slickers. The majority of the Pointe Building’s units measure at least 420 square feet, while the deluxe rooms in the Beach Building have a square footage of 600. Because of the windows overlooking the waterfront, the large rooms feel even more spacious. If you need still more space, opt for one of the Beach Building’s split-level loft suites. On the main level, the living room has a sleep sofa, and there’s a full kitchen with a stove, refrigerator, and dishwasher, stocked with dishes for eight and crystal glasses for white wine, red wine, and champagne. Upstairs, under a skylight, is the master bedroom with a king bed and an expansive master bath. 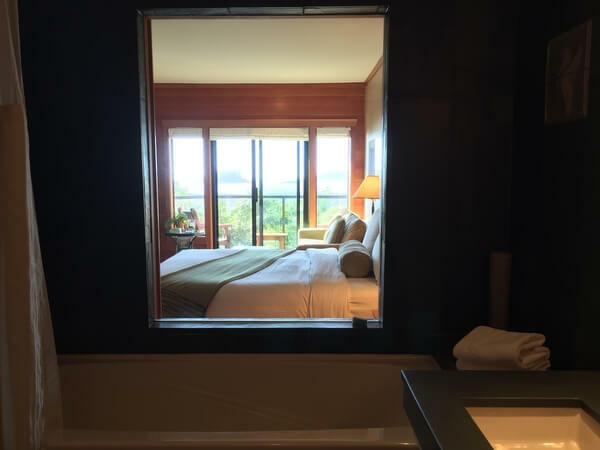 Most of the guest rooms have soaker tubs either directly beneath a window or positioned to take advantage of the view, but the tubs in the suites are especially sweet. In the oceanfront spa, staff start each treatment with a foot soak in the relaxation lounge. In addition to the menu of massages and body treatments, guests can also book private or semi-private yoga classes. The spa’s most scenic treatment room, a cute cabin dubbed the “Cedar Sanctuary,” is designed for couples. It overlooks the rocks above the ocean, and when you open the doors to the terrace, you can hear the rolling surf. Views of the ocean surround the inn’s restaurant on three sides, a lovely setting for the elaborate multi-course meals. 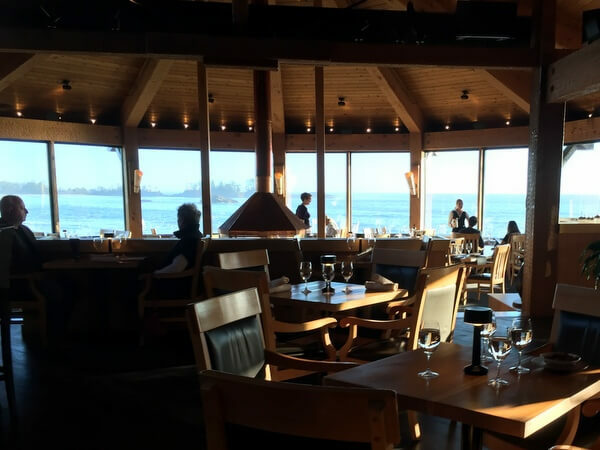 The Pointe Restaurant offers a new tasting menu every week, with separate tasting menus available for vegetarian and vegan guests, and the a la carte menus change with the seasons. Seafood always features prominently on the tables at The Pointe, with inventive dishes like cold-smoked sturgeon with trout roe and sauerkraut, octopus served in a split pea broth topped with a poached egg, or scallops layered over savory cakes colored a deep green from dried fir tips. A recent highlight, though, was a vegan dish, described simply as “Charred Turnip.” The humble root vegetable, braised in miso, was sliced and plated almost like a steak, layered over toasted farro and a garlicky black bean bagna cauda. It’s a short walk from the Inn to the beach. 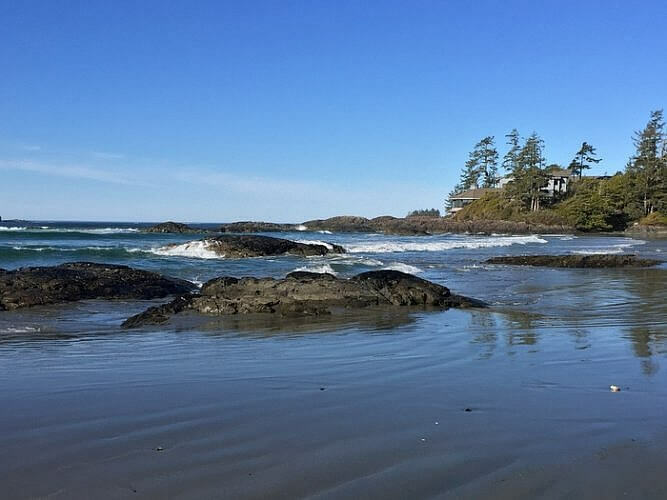 One detail about the Wickaninnish Inn that even owner Charles McDiarmid doesn’t need to tinker with is its stunning setting, above the sea and Chesterman Beach. 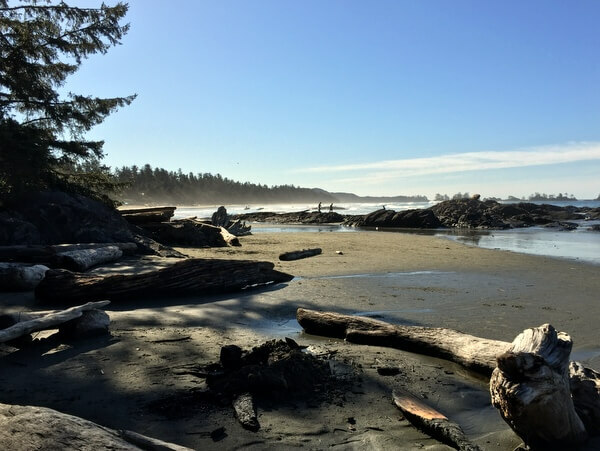 This long stretch of sand, lined with evergreens, and popular with surfers as well as beach walkers, is one of the most beautiful on the west coast. It’s a perfect setting for a perfect luxury inn that gets all the details right. 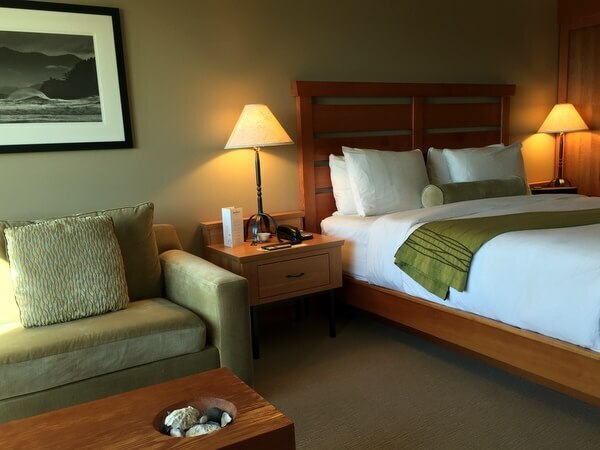 Double room rates at the Wickaninnish Inn Tofino start at CAD$360 per night. You can also book through Tripadvisor. 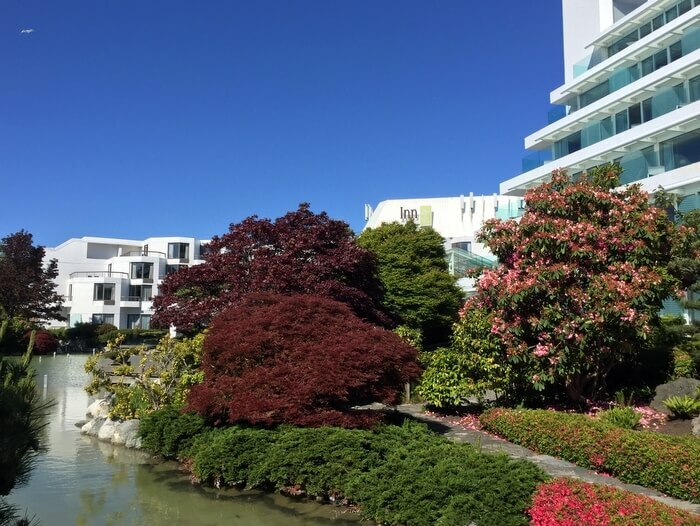 Hotel feature by Vancouver-based travel, food, and feature writer Carolyn B. Heller. Photos © Carolyn B. Heller. 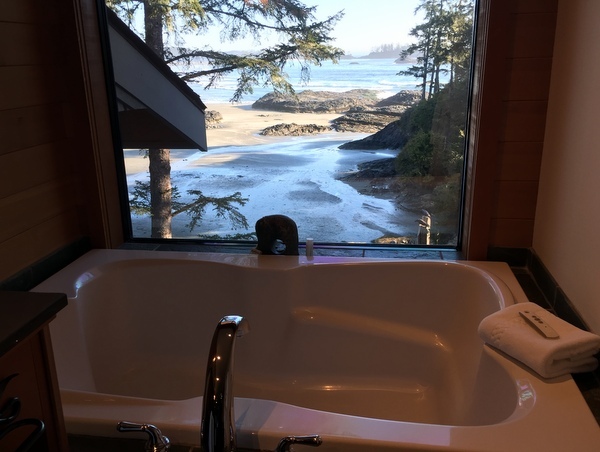 The Wickaninnish Inn, in partnership with Tourism Tofino, arranged my stay for review purposes.